Schedule your Discovery Flight today, only $49! Getting started on your flying adventure is easy. Contact us, schedule you discovery flight today. We understand pilots, and what it takes to be a pilot, like no one else. Rest assured. We'll walk you through the program step-by-step, from you discovery flight to your license. At our school you'll know exactly what your spending and why. A safe. friendly, comfortable, dynamic atmosphere in which to learn. A knowledgeable flight instructor to mentor you and accommodate your requirements. 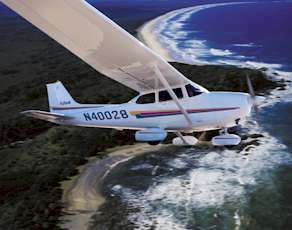 Training in new and dependable Cessna aircraft. A Computer-Based Instruction program that makes becoming a pilot easier than ever.